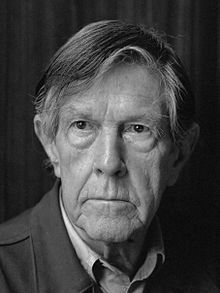 John Milton Cage Jr. (September 5, 1912 – August 12, 1992) wis an American componer, muisic theorist, writer, filosofer, an airtist. A pioneer o indeterminacy in muisic, electroacoustic muisic, an non-staundart uise o muisical instruments, Cage wis ane o the leadin feegurs o the post-war avant-garde. Creetics hae laudit him as ane o the maist influential American componers o the 20t century. ↑ Pritchett and Kuhn, Grove Online: "He has had a greater impact on music in the 20th century than any other American composer." ↑ "John Cage, 79, a Minimalist Enchanted With Sound, Dies". New York Times. August 13, 1992. Retrieved July 21, 2007. John Cage, the prolific and influential composer whose Minimalist works have long been a driving force in the world of music, dance and art, died yesterday at St. Vincent's Hospital in Manhattan. He was 79 years old and lived in Manhattan. ↑ Leonard, George J. (1995). Into the Light of Things: The Art of the Commonplace from Wordsworth to John Cage. University of Chicago Press. p. 120 ("...when Harvard University Press called him, in a 1990 book advertisement, "without a doubt the most influential composer of the last half-century," amazingly, that was too modest."). ISBN 978-0-226-47253-9. ↑ Greene, David Mason (2007). Greene's Biographical Encyclopedia of Composers. Reproducing Piano Roll Fnd. p. 1407 ("[...] John Cage is probably the most influential ... of all American composers to date."). ISBN 978-0-385-14278-6. This page wis last eeditit on 26 Februar 2018, at 22:47.